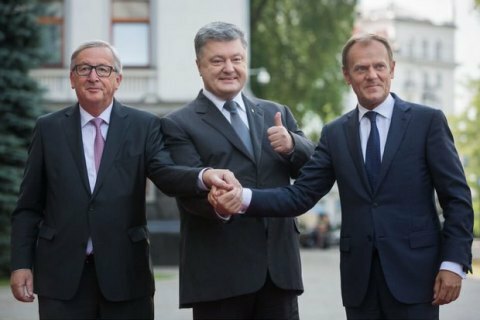 Poroshenko, Tusk and Juncker discussed a "Marshall Plan" for Ukraine. Ukraine has planned two major investment conferences for 2018, President Petro Poroshenko told a press conference on the results of the plenary session of the 19th Ukraine-EU summit. "Today we discussed the possibility of a new long-term plan for supporting Ukraine, which was proposed at the summit of the European People's Party - like a "Marshall Plan" for Ukraine - and Ukraine's use of the newly created EU external investment plan. This will be an important support for our efforts from economic stabilization to the economic growth of our state. In this context, we instructed to work out the possibility of organizing a powerful investment conference in Brussels in early 2018," Poroshenko said. The second conference will deal with the use of the gas transportation system, he went on. "We asked the European Commission to hold in 2018 a conference, an international forum on the prospects for the use of the gas transportation system of Ukraine, provisionally titled "The potential of the gas transportation system for Europe's energy security, " Poroshenko said. The long-term plan for supporting Ukraine (the so-called "Marshall Plan for Ukraine") will be unveiled at the Eastern Partnership summit in November.